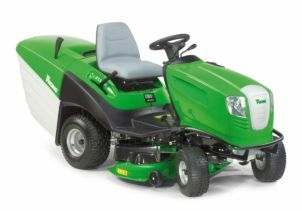 The 3 blade system ensures the perfect cutting pattern, catching grass even right at the edge of the mowing width. The grass catcher box has a huge volume and can be emptied effortlessly from the seat. Together with the forward / reverse drive lever, the ergonomic control panel, extremely small turning circle and excellent handling performance, lawn mowing becomes a new and rewarding experience.